Instill a love of art at a young age through a guided, hands-on gallery experience. Young Audiences Wolf Trap teaching artists will present a series of six workshops for caregivers and children ages 0-3. Learn how to integrate music, movement, and drama into everyday playtime to foster children’s developmental growth. This free six-part workshop series provides engaging arts based activities designed to instruct caregivers on how to use the arts at home to promote early learning. Contact education@noma.org or 504-658-4128 if you have any questions. 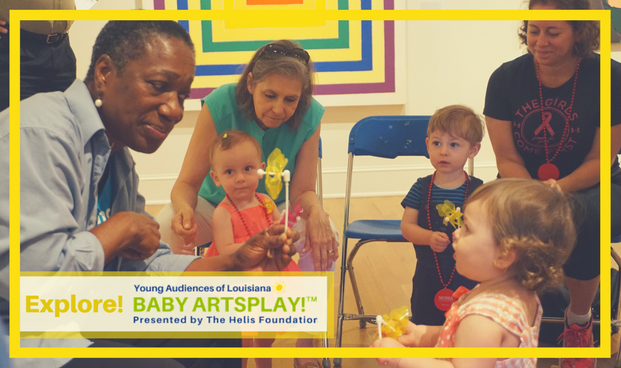 For over 50 years, Young Audiences of Louisiana has operated arts in education programs that promote academic excellence and social growth through the arts. Studies have shown that students enrolled in Young Audiences programs outperformed their peers on standardized tests, exhibited fewer disciplinary issues, and had increased school attendance. Young Audiences / Louisiana Wolf Trap has been an affiliate of The Wolf Trap Institute for Early Learning Through the Arts since 2010. The Wolf Trap Institute for Early Learning Through the Arts, a program of the Wolf Trap Foundation, was established in 1981 under a grant from the Head Start Bureau of the U.S. Department of Health and Human Services serving children birth through kindergarten. The goal of the Institute is to provide early childhood educators with professional development training in the use of performing arts techniques within educational curriculum goals and outcomes for young children. The infusion of arts-based techniques into daily routines provides powerful teaching strategies that can be used to enhance all areas of development, including emergent literacy, self-esteem and socialization, problem solving, receptive and expressive language, motor skills and self-regulation, science and math, conceptualization, and creativity, in order to provide a solid foundation for all future learning.